We are getting more and more signs that the stock market will face trouble in 2019. Some of these market studies center around breadth. The stock market’s breadth has been deteriorating recently. Some of this is due to weakness in foreign (non-U.S.) stocks. Long term breadth divergence is a normal part of rallies within bull markets. There’s nothing bearish about breadth divergences. HOWEVER, long term breadth divergences that have gone too far while accompanied by massive bull market rallies are a bearish sign for stocks. 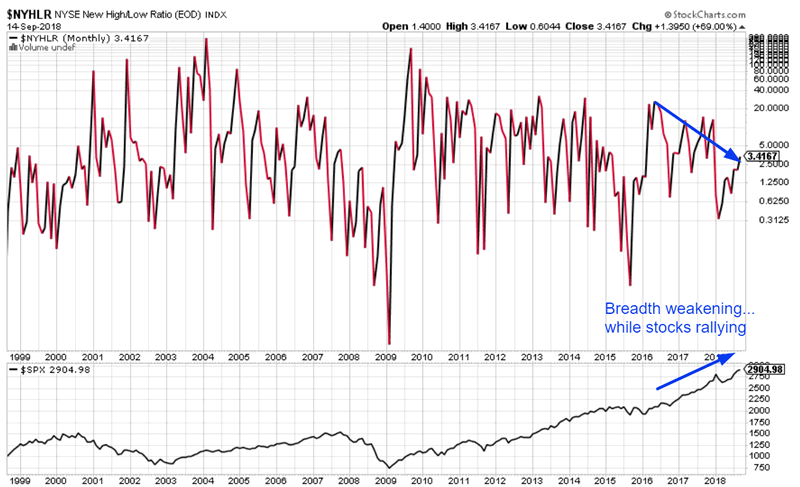 The NYSE New Highs/Lows Ratio measures the ratio of the # of stocks that are making 52 weeks highs vs. 52 week lows. This ratio has been falling since June 2016 while the S&P has been rallying. The S&P has gone up 38% from June 2016 – present. 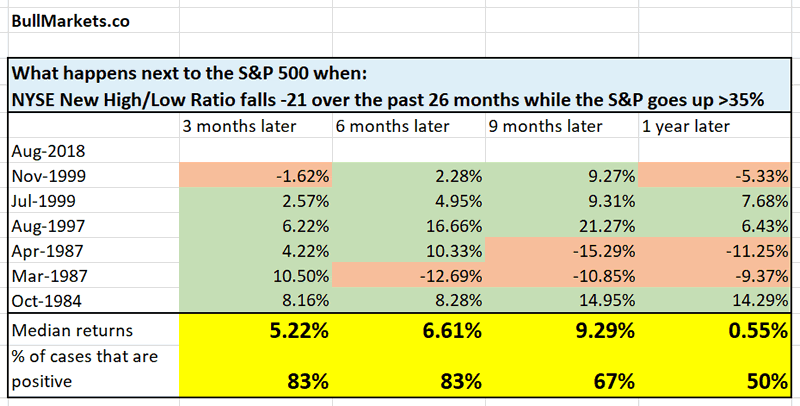 Here are the historical cases in which the NYSE New Highs/Lows Ratio fell at least -21 over the past 26 months while the S&P went up at least 35%. As you can see, the 1987 and 1999 cases feature prominently in this market study (the stock market made a “big correction” in 1987 and a bear market in 2000). The stock market was generally ok for the next 3-6 months. The stock market still went up for another 3-6 months in the 1987 and 1999 cases. The stock market’s performance notably dropped off 1 year later. This supports our case that the S&P 500 will do well going into 2019. 2019 will be a different story.